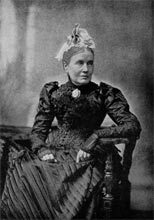 Jean Ingelow was born at Boston, Lincolnshire in England on March 17th, 1820. She was the daughter of William Ingelow, a banker. As a young girl she had many verses and tales published in magazines under the pen-name Orris. Her first volume, A Rhyming Chronicle of incidents and Feelings, was published anonymously when she was thirteen. Her next publication was not until 1851, when she put out Allerton and Dreux. However, her fame did not occur until her publication of Poems in 1863. Poems went through numerous editions and were set to music. In America they obtained even greater acclaim. In 1867 her publication of The Story of Doom and other Poems was one of her last poetic attempts until 1885 when her third series of Poems came out. Between her poetry publications were numerous novels, Off the Skelligs (1872) and John Jerome (1886) to name a few. Ingelow's poetry and songs were some of the most successful of the day. However, her style is often ridiculed. Jean Ingelow died July 20th, 1897 and was buried in Brompton cemetery, London. Ingelow was an accomplished children's author, yet not every poem is meant for them. An Ancient Chess Set. The story of a King. Like a Laverock in the Lift. A song in a children's book. The Long White Seam. A man admires his future wife sewing her wedding dress. One Morning, Oh! So Early. A great use of animation. Song of the Old Love. Losing someone due to death.